As previously reported in Organic Bytes (Issue #104), beekeepers in 24 states are experiencing record losses of honeybees. Some states have reported up to 70% disappearances of commercial bee populations. Researchers are struggling to find the causes of this mysterious collapse. A crucial element of this story, missing from reports in the mainstream media, is the fact that organic beekeepers across North America are not experiencing colony collapses. The millions of dying bees are hyper-bred varieties whose hives are regularly fumigated with toxic pesticides by conventional beekeepers attempting to ward off mites. 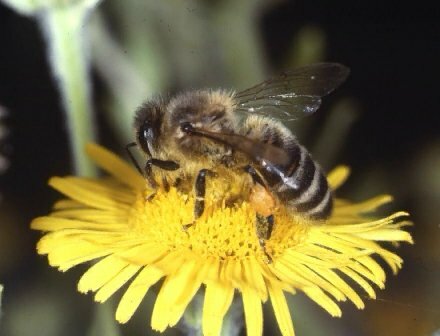 In contrast, organic beekeepers avoid pesticides and toxic chemicals and strive to use techniques that closely emulate the ecology of bees in the wild. Researchers are beginning to link the mass deaths of non-organic bees to pesticide exposure, genetically modified organisms (GMOs), and the common practice of moving conventional bee hives over long distances. "Natural" beehives appear less affected by the strange new plague dubbed colony collapse disorder. Colony Collapse Disorder in domestic honey bees is all the buzz lately, mostly because honey bees pollinate food crops for humans. However, we would not be so dependent on commercial non-native factory farmed honey bees if we were not killing off native pollinators. Organic agriculture does not use chemicals or crops toxic to bees and, done properly, preserves wildlife habitat in the vicinity, recognizing the intimate relationship between cultivated fields and natural areas. While no one is certain why honey bee colonies are collapsing, factory farmed honey bees are more susceptible to stress from environmental sources than organic or feral honey bees. Most people think beekeeping is all natural but in commercial operations the bees are treated much like livestock on factory farms. I'm on an organic beekeeping email list of about 1,000 people, mostly Americans, and no one in the organic beekeeping world, including commercial beekeepers, is reporting colony collapse on this list. The problem with commercial operations is pesticides used in hives to fumigate for varroa mites and antibiotics are fed to the bees to prevent disease. Hives are hauled long distances by truck, often several times during the growing season, to provide pollination services to industrial agriculture crops, which further stresses the colonies and exposes them to agricultural pesticides and GMOs. Bees have been bred for the past 100 years to be much larger than they would be if left to their own devices. If you find a feral honeybee colony in a tree, for example, the cells bees use for egg-laying will be about 4.9 mm wide. This is the size they want to build ­ the natural size. The foundation wax that beekeepers buy have cells that are 5.4 mm wide so eggs laid in these cells produce much bigger bees. It's the same factory farm mentality we've used to produce other livestock ­ bigger is better. But the bigger bees do not fare as well as natural-size bees. Varroa mites, a relatively new problem in North America, will multiply and gradually weaken a colony of large bees so that it dies within a few years. Mites enter a cell containing larvae just before the cell is capped over with wax. While the cell is capped, the bee transforms into an adult and varroa mites breed and multiply while feeding on the larvae. The larvae of natural bees spend less time in this capped over stage, resulting in a significant decrease in the number of varroa mites produced. In fact, very low levels of mites are tolerated by the bees and do not affect the health of the colony. Natural-size bees, unlike large bees, detect the presence of varroa mites in capped over cells and can be observed chewing off the wax cap and killing the mites. Colonies of natural-size bees are healthier in the absence mites, which are vectors for many diseases. Organic beekeeping, as defined by certification agencies, allows the use of less toxic chemicals. It's more an IPM approach to beekeeping than organic. Commercial beekeeping today is just another cog in the wheel of industrial agriculture ­ necessary because pesticides and habitat loss are killing native pollinators, and vast tracks of monoculture crops aren't integrated into the natural landscape. In an organic Canada, native pollinators would flourish and small diversified farms would keep their own natural bees for pollination and local honey sales. The factory farm aspects of beekeeping, combined with an onslaught of negative environmental factors, puts enough stress on the colonies that they are more susceptible to dying out. Sharon Labchuk is a longtime environmental activist and part-time organic beekeeper from Prince Edward Island. "I'm on an organic beekeeping list of about 1,000 people, mostly Americans, and no one in the organic beekeeping world, including commercial beekeepers, is reporting colony collapse on this list. The problem with the big commercial guys is that they put pesticides in their hives to fumigate for varroa mites, and they feed antibiotics to the bees. They also haul the hives by truck all over the place to make more money with pollination services, which stresses the colonies." "Most of us beekeepers are fighting with the Varroa mites. I'm happy to say my biggest problems are things like trying to get nucs through the winter and coming up with hives that won't hurt my back from lifting or better ways to feed the bees. This change from fighting the mites is mostly because I've gone to natural sized cells. In case you weren't aware, and I wasn't for a long time, the foundation in common usage results in much larger bees than what you would find in a natural hive. I've measured sections of natural worker brood comb that are 4.6mm in diameter. What most people use for worker brood is foundation that is 5.4mm in diameter. If you translate that into three dimensions instead of one, it produces a bee that is about half as large again as is natural. By letting the bees build natural sized cells, I have virtually eliminated my Varroa and Tracheal mite problems. One cause of this is shorter capping times by one day, and shorter post-capping times by one day. This means less Varroa get into the cells, and less Varroa reproduce in the cells. Who should be surprised that the major media reports forget to tell us that the dying bees are actually hyper-bred varieties that we coax into a larger than normal body size? It sounds just like the beef industry. And, have we here a solution to the vanishing bee problem? Is it one that the CCD Working Group, or indeed, the scientific world at large, will support? Will media coverage affect government action in dealing with this issue?" These are important questions to ask. It is not an uncommonly held opinion that, although this new pattern of bee colony collapse seems to have struck from out of the blue (which suggests a triggering agent), it is likely that some biological limit in the bees has been crossed. There is no shortage of evidence that we have been fast approaching this limit for some time. Few organic bee keepers have reported bee losses, which suggests that natural and organic bee keeping methods may be the solution. "Natural Beekeeping" by Ross Conrad, does an excellent job explaining both the roots of the current bee crisis and long-term solutions for healthy bee hives. WASHINGTON -- Scientists and worried beekeepers agreed Tuesday to explore pesticide poisoning, diseases, parasites and management practices in an effort to find out why billions of honeybees in 25 states have died in the past six months. Following two days of brainstorming, about 80 bee experts agreed to recommend an urgent research agenda aimed at sorting out the causes of ``colony-collapse disorder,'' an unusual die-off that became apparent last year. The conference in Maryland was set up after a House agriculture subcommittee criticized the Department of Agriculture for not responding to the die-off quickly enough. ``We should have been doing this two months ago,'' said Troy Fore, of Jessup, Ga., executive secretary of the American Beekeeping Federation. For Michigan beekeepers, an answer can't come too soon. Beekeepers here are among those afflicted by the unexplained disappearance of entire colonies of bees, said David Anthony, president of the Michigan Beekeepers Association. Commercial beekeepers lost as many as 80 percent of the bees they transported south over the winter. The colony-collapse phenomenon occurs when worker bees leave the hive and don't return. Queens and bee larvae remain inside the hive until they die. Colony-collapse phenomenon resembles many of the ways bees have always died, scientists agreed, but there's one notable exception: The empty hive is shunned by other bees and insect scavengers. Besides the honey they produce, bees provide billions of dollars worth of pollination services each year for American agriculture. A National Academy of Science committee warned a few months ago that their role in that area has been woefully neglected. In southwestern Michigan, bees are used to pollinate cherries, apples and blueberries, and vegetable crops such as cucumbers. Scientists at the conference had many hypotheses for the die-off but no answers. They theorized that the disorder could have a tangle of contributing factors -- each benign on its own but combining to create a deadly threat. A spreading infestation of mites that invaded the U.S. bee industry in the 1980s could have weakened the insects and left them susceptible to infections they have resisted for ages. Pesticides, especially a relatively new class of chemicals called neonicotinoids, could have sublethal effects that do the same thing. These chemicals are now America's most widely used pesticides -- applied to crops, at homes and on golf courses, for example -- and they act by disrupting the insects' nervous systems. This might be related to the failure of worker bees to return to hives, as if they have become disoriented. ``It's too strong a coincidence to ignore,'' said Maryann Frazier, a Pennsylvania State University entomologist. She said samples have been sent to a U.S. Environmental Protection Agency lab in North Carolina to be analyzed for more than 200 pesticides. Still another theory is that mites could be spreading a disease-causing virus among bees. Bee-management practices also must be investigated, scientists said. Jerry Hayes, a Florida Department of Agriculture entomologist, said bees are given a variety of antibiotics to ward off infections, and this may be interfering with natural bacteria in their guts that help ferment pollen to produce a hive food. One experiment in countering the effects of the disorder involves treating hives with acids or irradiating them. Kalamazoo Gazette staff writer Rosemary Parker contributed to this story.